The effect of a multi-strain probiotic on growth performance, non-specific immune response, and intestinal health of juvenile turbot, Scophthalmus maximus L.
Probiotic is well known because of its health benefit on the host, including improve growth, treat disease, and enhance immunity. Currently, probiotic has been widely used in aquaculture. However, there is little information about the effect of probiotic on turbot. 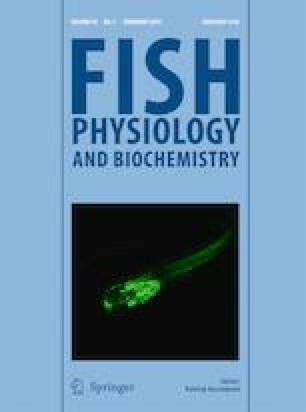 Therefore, an effort was made to explore the effect of a multi-strain probiotic on growth performance, non-specific immune response, and intestinal health of juvenile turbot, Scophthalmus maximus L. One hundred eighty juvenile turbot (20.04 ± 0.23 g) were randomly divided into three groups (T0, T1, T2), and fed diet were formulated to contain 0%, 1%, and 5% multi-strain probiotic, respectively. Sixty days after the feeding experiment, the growth performance, body composition, enzyme activities, and intestinal microorganism of turbot were analyzed. T2 and T1 showed better growth performance and significant higher (P < 0.05) enzyme activities than T0 (except lysozyme). Moreover, the IV (intestinal villus), IW (intestinal wall), and GC (goblet cell) were well modulated in probiotic treatments. Furthermore, Lactobacillus was found colonized in the intestine of the group fed with 5% multi-strain probiotic. These results suggested adding dietary multi-strain probiotic could positively affect for turbot aquaculture. Tongjun Ren and Yuzhe Han contributed equally to this work. This work was funded by the Public Science and Technology Research Funds Project of Ocean of the State Oceanic Administration of the People’s Republic of China (Grant No. 201405003) and the Science and Technology Research Funds Project of the Dalian City Oceanic and Fishery Administration, Liaoning Province, China (Grant No. 20140101). Thanks to Dalian B&T biotechnology Co., Ltd. for multi-strain probiotic.